Way back in, I dunno, the early to mid 2010s, there was some debate as to whether, say, white IPAs could really be considered worthy of inclusion within the India pale ale canon. There was similar debate when session IPAs first appeared on the scene – "It's just a hoppier/unbalanced pale ale". These days, all bets are off it seems and nobody gives two hoots where any stylistic barriers might once have sat. At least, that's the sort of impression that can be drawn from the latest "IPA" series from 3 Ravens. 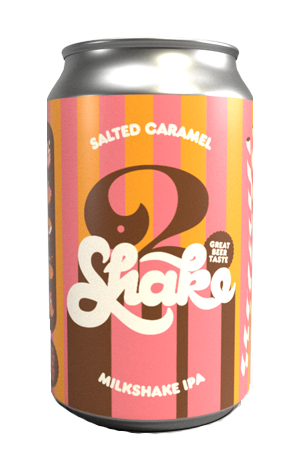 On the back of their successful Juicy NEIPA line comes Shake, focusing on "milkshake IPAs", typically beers featuring a significant proportion of lactose (once only used to add sweetness and creaminess to stouts) and often vanilla too. The first was their 2018 GABS beer, going by the name Moussey Juicy but, given there was little juicy about it, now we have Shake. First squeeze from the chiller under the new banner is Salted Caramel. There are New World hops in there, albeit added in such volumes and so late on that the bitterness is a hefeweizen-esque 10 IBU. There's also lactose, vanilla, oats and pectin – basically, a whole stack of adjuncts intended to make the beer rich, thick and sweet. With plenty of crystal malt in the mix too, it's a beer that achieves its goal, albeit more on the salted caramel and milkshake front than the IPA one. When writing the event listing for the beer's launch in cans, we went with "salted caramel combined with a rich amber ale"; having had more time to process, it's probably more akin to a sweet, low ABV barleywine.